Section Five of the Relationship Series was called Love & Mediocrity and it was a dissection of the notion of fidelity. Titles such as Man and woman trying to kiss each other in front of all their lovers of the past and all their lovers of the future suggested the presence in every relationship of a long regress of memories and associations which made a mockery of the idea that in the love relationship one ineffable and unchanging ‘essence’ was connecting with another. The shock is in no way connected with the ‘other’ person, for they could never be the cause. Oneself and the mirrored image of oneself – disguised as the other person – play this trick time and again. Lenkiewicz at work on 'Self-Portrait with Lover', 1976. 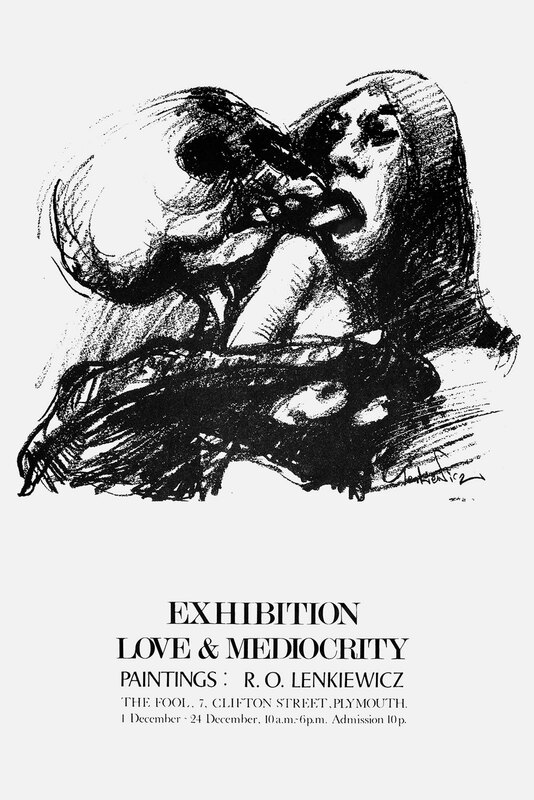 THIS COLLECTION IS SECTION TWO OF THE ‘LOVE & MEDIOCRITY THEME: THIS THEME IS ONE OF FOUR SECTIONS – (RELATIONSHIPS; ATTITUDES TOWARDS LOVE), THE OTHERS ARE ‘LOVE & ROMANCE’, ‘LOVE & TRAGEDY’ AND ‘LOVE & HUMOUR’. THE PRESENT EXHIBITION IS EASIER TO APPROACH BY PURCHASING THE NOTES AVAILABLE AT THE DESK. IT IS TO BE UNDERSTOOD THAT THESE PROJECTS ARE VIEWED BY THE PAINTER AS A MEANS OF PRESENTING INFORMATION THAT HAS RESULTED FROM OBSERVATION, INQUIRY AND RESEARCH. AT NO POINT ARE THESE EXHIBITIONS VIEWED BY HIM AS HAVING ANY CONNECTION WITH WHAT IS CALLED ‘ART’.